2007 Jamaican Championship: Elliott wins again! Peter Myers, "Elliott takes LASCO Chess Champs ," 3 October 2007, Jamaica Chess Federation. 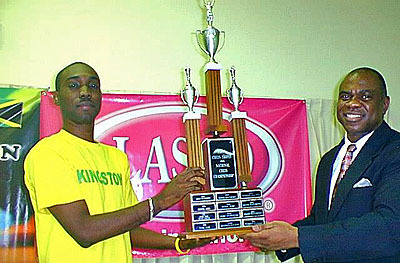 FM Warren Elliott (left) accepts the LASCO National Chess Champion Trophy from JCF President Ian Wilkinson in this file photo. Photo by Jamaican Chess Federation. Jamaica's number one internationally ranked player FIDE Master Warren Elliott, won the 2007 LASCO National Chess Championship, after scoring a final round victory over seven-time champion National Master Shane Matthews at the Norman Manley Law School on Saturday. Elliott finished with 9.5 points from eleven games to claim his fifth hold on the National Champion title. In second place was National Master Equitable Brown who defeated National Master Mark Holness to finish on nine points, while third place went to National Master Russel Porter who ended on seven points after dispatching Mikhail Solomon.